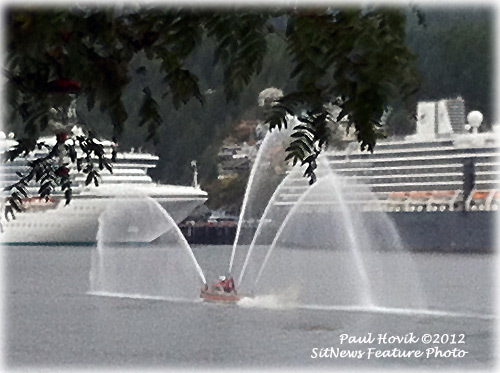 The Sapphire Princess (left) and the Oosterdam (right) before departing Ketchikan, officially ending the 2012 cruise ship season. This photograph was taken from Pennock Island. Alaska: Board approves new stock manager search - The Alaska Permanent Fund Corporation Board of Trustees reelected Bill Moran Chair and Steve Rieger Vice-Chair at its annual meeting on September 26 and 27 in Anchorage. The Board also approved a new stock manager search and reviewed the final audited financial statements for Fiscal Year 2012. Callan Associates, the Board’s general consultant, reported that the Permanent Fund returned -0.01 for the fiscal year 2012, ending on June 30 with a value of $40.3 billion. Adverse conditions in the overseas stock markets produced a noticeable drag on the Fund’s performance, but solid returns in the bond and real estate portfolios helped counteract those losses. The Fund’s alternative assets had mixed performance for the period. Fish Factor: Heavier, current driven debris still to land By LAINE WELCH - At least 1.5 million tons of debris from Japan’s 2011 tsunami is still afloat, and at least half of it is expected to hit Alaska’s coastline. The region from Yakutat to Gore Point off the Kenai Peninsula will likely see the heaviest debris piles, but Southeast Alaska and other areas will see chunks of junk as well. Those are conclusions of a fascinating new report by Washington Sea Grant titled Debris Accumulation Scenarios in Washington State from the March 2011 Tohoku Tsunami . The Sea Grant report, authored by Ian Miller and Jim Brennan, says most of the debris should land within four years of the 2011 tsunami, with Alaska receiving more in subsequent years as it is released from ocean gyres. Most of the debris that has landed so far has been lighter items driven by the wind, such as buoys and astonishing amounts of Styrofoam. Trackers find that plastic particularly troublesome, said Dave Gaudet, marine debris program coordinator for the Juneau-based Marine Conservation Alliance Foundation. “We don’t have any definitive data on what Styrofoam does to the wildlife and the environment. We do know that it breaks up and animals ingest it and it gets into the ecosystem. So we need to be vigilant for that,” Gaudet said. Southeast Alaska: Historic Bridge For Sell - The historic Brotherhood Bridge in Juneau is up for sale. The 319-foot long by 30.1-foot wide reinforced concrete slab-bridge is supported by welded steel plate girders and designed by Roy Peratrovich, Jr. It was dedicated on Alaska Day, October 18, 1965 to carry traffic on the Glacier Highway over the Mendenhall River and to memorialize the 50th anniversary of the Alaska Native Brotherhood. The dedication had some distinguished dignitaries from the Alaska Native Brotherhood and Alaska Native Sisterhood as well as government and civic leaders: Secretary of State Hugh Wade, Highway Commissioner Donald McKinnon, Senator Frank Peratrovich, Senator Richard Peter, Representative Elton Engstrom, Representative Bill Ray, Andrew Wanamaker and both Roy Peratrovich Sr. and Jr. among others. Alaska: Teadwell Says Alaska Should be Removed from National Report; Rebuts Claims of Voter Suppression – Lieutenant Governor Mead Treadwell yesterday refuted conclusions of a national report accusing Alaska of voter suppression. The report “Latino Voter Disenfranchisement in 2012” was published by the Advancement Project based in Washington, D.C., whose Co-Director is Judith Brown Dianis. The report claims Alaska is one of 23 states that “currently has legal barriers that disproportionately impact voter registration and participation by Latino citizens.” The report says Alaska does this by requiring proof of citizenship for voter registration and a practice of purging its voter registration rolls. In a letter to Brown Dianis, the lieutenant governor defends the state’s purging process by laying out the multiple steps the state takes to ensure no eligible voter is removed from the voter rolls. “Our goal is clear – we need to ensure integrity in the election process and ensure that elections are accessible to all eligible voters,” Treadwell said. Alaska: Foster youth get help from State & UAA partnership; Easing transition to adulthood is goal - In an effort to provide integrated services to youth aging out of foster care, the Office of Children’s Services (OCS), in partnership with the Child Welfare Academy (CWA) of the University of Alaska, has created a position to enhance support and outreach services to current and former foster youth between the ages of 16 and 23. Southeast Alaska: SHI AWARDED $4.5 MILLION IN GRANTS FOR EDUCATIONAL PROGRAMS, WALTER SOBOLEFF CENTER - Sealaska Heritage Institute (SHI) has received three federal grants for educational programs and to help fund construction of the Walter Soboleff Center in Juneau. Alaska: Wilderness Awards Recognize Efforts - Forest Service employees, along with employees from Alaska Department of Fish and Game and Southeast Alaska Conservation Council, were recognized for their efforts to improve the quality of Southeast Alaska's Wilderness areas. Regional Forester Beth Pendleton presented group Wilderness Champion, Wilderness Partner of the Year, and Line Officer Wilderness Leadership awards in Juneau Friday, September 21. Sitnews reserves the right to edit.